Forget the story, suspense, or scares of survival horror. 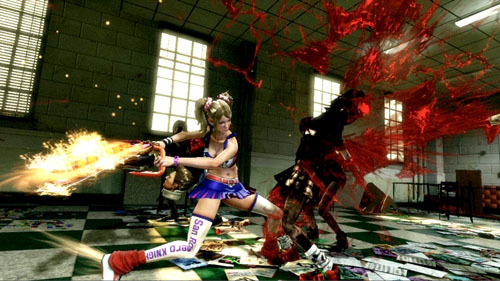 Lollipop Chainsaw is a straight up hack n’ slash arcade style video game that is loads of zombie slaughtering fun. It’s just you, a chainsaw, a hot dumb cheerleader sucking on a lollipop, and her adorable boyfriend’s head, which she keeps attached to the waistband of her miniskirt. Lollipop Chainsaw is perverted, campy fun from beginning to end, full of references to classic horror movies and a soundtrack combining thrash metal, industrial, and 80s classics like Toni Basil’s “Mickey,” Dead or Alive’s “You Spin Me Round,” and even Buckner and Garcia’s fricking “Pac Man Fever.” If I didn’t know better, I’d think this game was my idea. While you can build up your powers and purchase upgrades along the way, the game is essentially good old button mashing fun. You’ll never remember all the combos you get, so you’ll memorize a few crucial ones and try your best to perform them. But when you’re constantly surrounded by hordes of zombies, your fingers are just going to mash mash mash! As you build up your strength, you’ll really begin to feel unstoppable, which is what gives the game its rockin’ feel (along with the constant but changeable background tune). There are also plenty of quick time events along the way, but even they don’t seem to slow you down. The most noticeable challenge is that, like most modern games, it has an auto save feature, so sometimes you’ll die and find yourself tossed back to an earlier point, requiring you to redo some really annoying stuff. Another annoyance is the super quick flash of comic-style, campy info across the screen when new characters appear. You don’t have enough time to read them in full during the game, and while they’re accessible in the menu after you finish, it becomes tedious going through the list and reading them out of context. Also pointless are the generally useless and unfunny voicemails characters leave you. The game has six stages and can be completed pretty fast. And just when you think the game is getting repetitive, you get the old school arcade game stage; you play through takes on maze, climbing, platformer, block, and shooting games. And since the upgrades you buy carry over, you could easily get the urge to run through this game more than once—and definitely at Halloween parties. This entry was posted in Living in the 80s - forever, Sound Check - The Songs Stuck in My Head, The Evil of the Thriller - Everything Horror, What I'm Doing With My Joystick and tagged 1980s, 80s, arcade games, Lollipop Chainsaw, video games, Zombies. Bookmark the permalink.